Torridon and Yeomans Cottage01263 579297work01263 579297fax Self-cateringTORRIDON: There is a large sitting room and dining area with large windows and an exit into the garden. YEOMAN'S: No. 5 is the end cottage in a row of five former farm workers' cottages and is in a central village location. They date from the mid 18th century and are built of flint and brick. The owner (Ann Youngman) restored and partly rebuilt these cottages in the late 1070s as they were in a very dilapidated state. Ann and Peter Youngman run a busy farm holiday bed and breakfast business at nearby Shrublands Farm. The cottage itself has been refurbished throughout. It has a small garden and patio with its own parking space immediately adjacent. Garden furniture and BBQ equipment is provided for the use of guests. TORRIDON: There is a large sitting room and dining area with large windows and an exit into the garden. 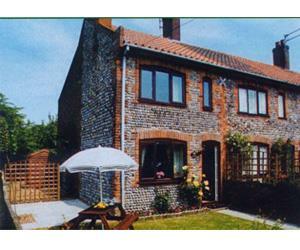 The properties are approximately 1.5 miles from the village of Overstrand and our nearest sandy and clean beach. Cromer, with its beautiful church, Victorian pier and Safeway supermarket is 2.5 miles away. There are numerous walks in the area and many tourist attractions and National Trust properties. The city of Norwich is 30 minutes away and is well worth a visit. This is also a wonderful area for bird watching and seeing the seals along the coast at Blakeney. This corner of Norfolk is at present relatively unspoiled and provides an opportunity to get away from it all. From A149 turn left or right (depending on approach direction) to Northrepps village. Proceed 1 mile to centre of village. Past Foundry Arms pub on left for 50yds. From Cromer - 3 miles.